When you entrust the care of your child to us, you can do so with confidence. We provide planned activities that are fun, educational, stimulating and provide social interactions that are friendly and rewarding for both the carers and your children. Depending on their age, your child will spend their days exploring either the Little End or the Big End. 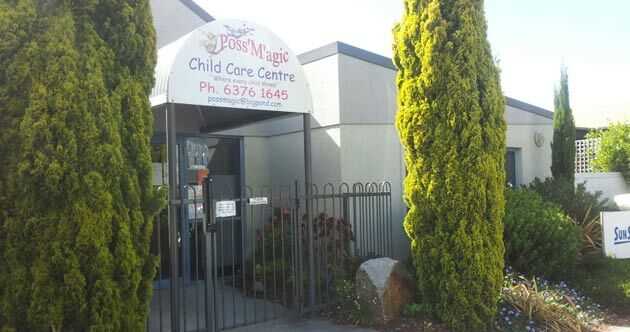 Poss’M'agic Child Care Centre was purpose built with a separate kitchen, sleep rooms, cot room, change room and stimulating play areas appropriate for your child’s age and development. Our facilities are fully accredited and well maintained so children are able to play safely within the Centre’s boundaries. All equipment is well maintained and renewed regularly and safety checklists and audits are carried out on a regular basis. Our beautiful outdoor area is adorned with a huge shady tree, lots of protective shade cloth plus an extensive lawn area with a huge sandpit and a great soft fall area with climbing aparatus as well as a blossoming vegetable garden. Both the Little End and Big End have large indoor play areas which are fully air conditioned and designed for all kinds of play appropriate to the age group. Our centre is based on the core principles and beliefs that early childhood is a unique stage in life. The way we introduce the children to early learning is important as it is the foundation on which children will begin to build the rest of their lives. Our comprehensive education program encourages children of all ages to explore, wonder and express themselves in a socially and emotionally stable environment. We are committed to ongoing improvement and to exceeding policy requirements. Please take the time to view the policies that are important to us when it comes to caring for your children. Become part of the Poss’M'agic family today, simply click here to get started.